The plan could create a modern-day equivalent of the European emperor envisaged by Napoleon Bonaparte or a return to the Holy Roman Empire of Charlemagne that dominated Europe in the Dark Ages. Yes, that’s right. The EU is at risk of transforming from a sometimes-ineffective but well-meaning bureaucratic nightmare quite literally into a brutal religious dictatorship in which no-one can see because all lighting was banned by Brussels. And what’s the plan, you ask? Why, nothing less than a devious scheme to merge the presidencies of the European Council and the European Commission! It’s unclear why this would result in the scrapping of Britain (or indeed what it means to ‘scrap’ a country anyway), but perhaps the author of this exclusive exposé was badly burned when he got a dual-fuel deal on his utilities and some bright spark delivered his gas and electricity through the same pipe. The two senior EU bureaucrats, Mr Barroso and Mr Van Rompuy, are locked in a bitter power struggle to determine who is the true big cheese or ‘grand fromage’ in Europe. Thank God that they want to be the grand fromage and not the große Käse, or the Express ’ typewriter (which has had all filthy, foreign diacritics removed) would’ve been unable to cope. In reality, there may be a few guys in Europe who have had a little blue-sky thinking session and wondered whether rationalising the mad European institutional labyrinth with a single big Président might be a good place to start. That’s it. If they were genuinely challenging the existence of Britain, we’d be out of Europe faster than a hedge fund’s capital gains. There are three ways you can take this story: you could be a sneery, sad newshound who finds this hilarious; a Machiavellian newshound who thinks we should get out of Europe and thus sees this as a slightly rancid means to an end; or, you could be an unfortunate Express reader, for whom this is news, taken as a fact as cold and hard as fromage cheddar dans le réfrigérateur. How are stories like this allowed to be published? If anyone buys the Express other than purely ironically, and we have to assume they do, this kind of crap is dangerous. 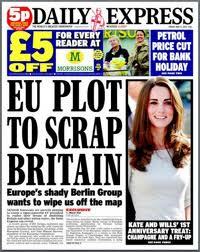 There are good, interesting reasons to be involved in, or wary of, various aspects of the European project, but out-and-out factless antipathy doesn’t help anyone, except possibly the Express ’ proprietors. In fact, their willingness to treat their readers with such disdain is rather tasteless. Like cottage cheese. Which, unhelpfully for sarcastic sub-editors on a deadline, translates to blanc à la faisselle. But, like the EU, it requires more than a GCSE in French and some hysterical newspaper-stoked fear to understand.